We live in a fast paced world but King Solomon advice that there is a time for everything! ‘To everything, there is a season a time for every purpose under heaven. Ecclesiastes 3:1’ wall words are available from DecorativeLettering. These are suitable for every room. However, in this case, they were applied in the dining room, with a pair of windows either side. They look great! They tie in with the chandelier, dining table, and chairs. These wall letters will remind friends and family to not only slow down but to be patient. Are you looking for unique wall decor? Try wall quotes from DecorativeLettering. Not only are they affordable, they are also very eye catching! The wall lettering is pre-spaced so that you have an easy time putting them up. The application is very simple: peel the underlying sheet and stick the wall words onto the wall! We also have a customer rewards program: you get to earn points with every purchase. If you refer a friend to us, they will get 10% off on their first purchase. You too will earn points on this purchase: now that is a deal! We also have an experienced team of designers waiting to work on your submission. 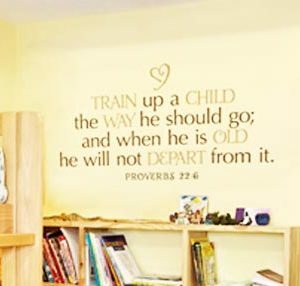 Do call or email: we would love to help you decorate your study room with inspiring wall words!